Today I am going to share with you an article from the Sydney Morning Herald by Andrew Woodhouse, the column in question is called Heckler where readers are invited to send 400 words on what makes their blood boil. I found this article to be very funny and poignant in this day and age. 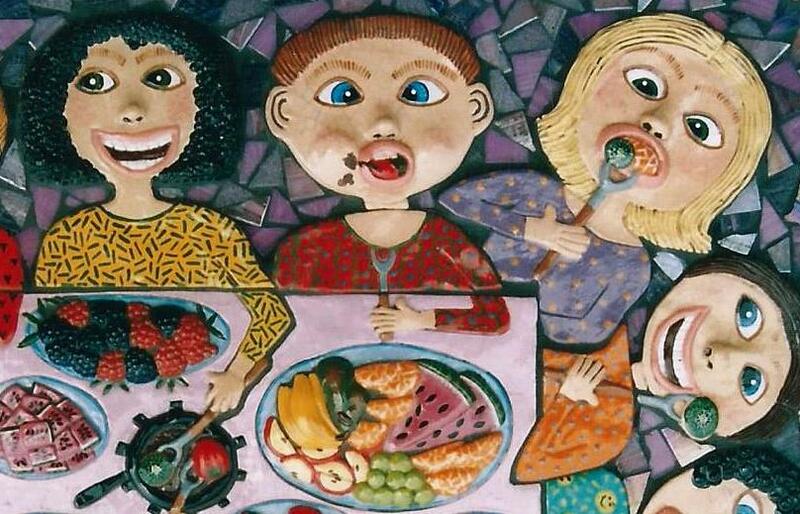 I have been a vegetarian for at least the last 30 years and just recently finding out that I am also Coeliac (gluten intolerant)and we have many friends with different food allergies or dietary requirements so I could really relate! 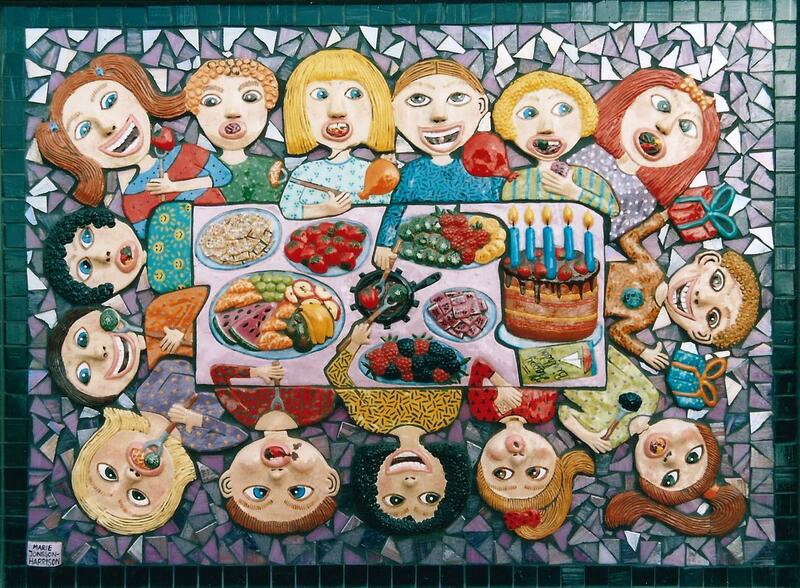 This artwork is called “Over the teeth around the gums look out stomach here it comes” and is handmade ceramic and mosaic and as you can see is full of people stuffing their faces with chocolate fondue with fruit, and you don’t see many people allergic to that! Over the teeth around the gums, watch out stomach here it comes! 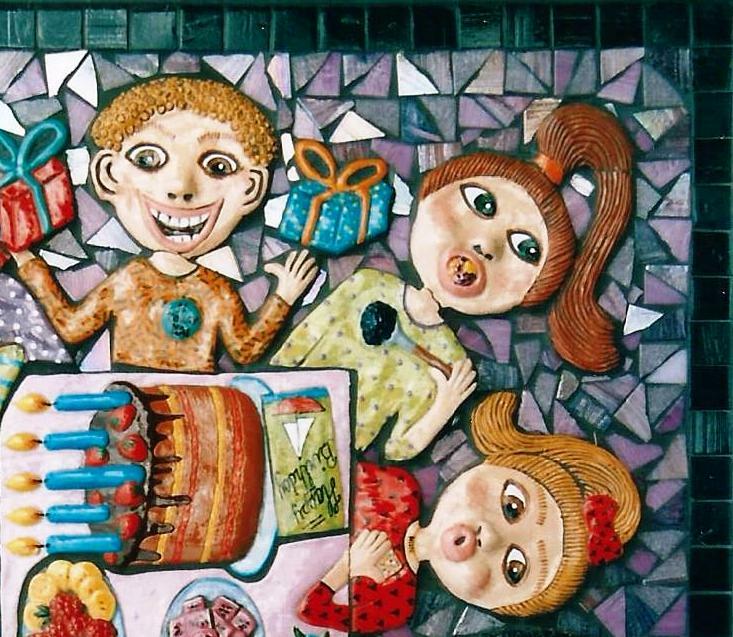 Guess who’s coming to dinner? No one, now! any more. We will all be going out for dinner, where my guests can torment cafe staff instead of me about the provenance of food ingredients, their original soil quality or, unspeakable manufacturing provenance. At my own recent dinner, my Master Chef skills were exemplary, when one considers a lack of any formal, or even informal, training. My heritage recipe for brandy cream topping makes eyes roll, for all the right reasons, even after guests have withstood my steak a la Andre with its signature, knock-em out cognac and port sauce (or is that jus?). allergy. The last had type-two diabetes, couldn’t even look at a peanut and would rather vomit than consider the thought-of monosodium glutamate or food essences, despite medical research showing that such aversions are scientifically ill-founded and deeply erroneous. I got the impression they thought I was trying to poison them or that they’d break out in hives, become pale and floppy, develop tongue swelling or anaphylactic shock and then rigor mortis. So we couldn’t eat meat, fish, chicken, pasta, salt, vanilla ice-cream, any dairy or soy products, yogurt, eggs, sugar, gluten, honey, nuts, oysters, bread and butter or anything remotely derived from any animal, no matter how humanely “murdered”. Even cooking with, let alone drinking, tap water containing minuscule traces of fluoride was verboten: brain damage is allegedly a possibility. Even offering a lettuce leaf for dinner was dangerous unless proved to be “organic”. I thought this just meant it was made up of living organisms, as distinct from dead ones, Now it’s a nebulous term debauched by trendy inner-city ideologues who’ve never picked up a shovel of dirt. Now I’m eating what I like and my friends eat their preferences. Let the waiter work it out. Till next time happy painting and sculpting and hosting dinner parties!